A group of little ladies get a lesson in dance from Rochelle Clarkson at Alliance Dance Academy in Bluffton. 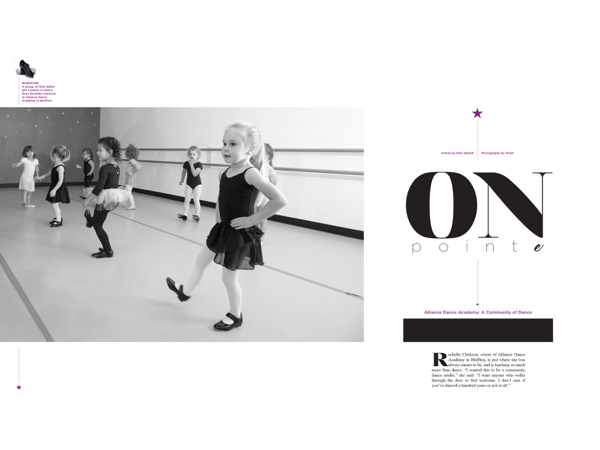 While the road to here has been a bit circuitous, each place and experience along the way has refined Clarkson’s passion and ability to bring dance, along with a real sense of community to her one-of-a-kind, one-year-old academy. “That dance thing draws you back in,” she said. After dancing from childhood through college, performing professionally, facing a career-ending illness, dancing at Disney World, founding and ultimately retiring from her Florida dance business, working for other studios and retiring again, it took catching up with an old friend to bring clarity to her future. “On a business vacation to Asheville, my husband and I caught up with friend and motivational speaker Brian Biro, and he said, ‘You know, we’re all put on this earth to do one thing. It is your purpose in life to find out what that is and then give it away,’” Clarkson said. After years of pushing against the pull that dance had on her, and a couple of attempted retirements, everything clicked into place. “I thought, okay, now I know what I’m doing. Anything in the arts you don’t do for the money, you do it for the love of what you do and wanting to share it with other people. I excused myself from the table and went outside to call my mom. 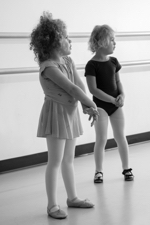 I said, ‘Mom, guess what I’m doing?’” Alliance Dance Academy opened less than six months later. A future ballerina in training strikes a pose. Two young students listen carefully to instruction from their teacher. Accountability is encouraged and expected from every student. “I put the responsibility on the kid, which is not normal these days. If your kid has the wrong tights on, I’m not going to come to you; I’m going to come to the kid. I make them bring in their report cards and show me they are doing all the things they are supposed to.” Open just over a year, Clarkson’s approach has certainly caught on. The ADA studio community has reached nearly 200 families, and growing. Leotards, tights, and shoe fittings are also available to make being a part of the ADA community even easier. In addition to ADA’s inviting and user-friendly studio space, kid safety is the first priority. Instructors are carefully vetted and go through thorough background checks. Additionally, Clarkson and all ADA instructors have the same teaching philosophy, all have college degrees, and all have at least six years of training in teaching dance. “In my world, if you are focused enough to get a college degree, then you are focused enough to teach here,” she said. Connecting ADA and herself with the community has forged a beneficial circle-of-life sort of system, where Clarkson has cultivated in-trade relationships with local business owners and neighbors whose children (or themselves) want to dance. “I get my hair cut as a trade-out. I work out as a trade-out. I eat dinner as a trade-out,” she said, building on the idea that ADA is not only a place to dance, but a place where everyone is welcomed into the community and encouraged. One day Clarkson may attempt retirement again. Until then, she is just where she was always meant to be: sharing the joy of dance, building a community where everyone is welcomed and encouraged, and where Turning Pointe waits for the weekends to set her sails to the wind. Alliance Dance Academy is located at 21 Scott Way, Bluffton. For more information, please visit alliancedanceacademy.com or call (843) 757-8277. I want to thank you for all you have done for your dance students. Clare Phillips is my granddaughter and she loves to dance—she has really blossomed this year. Hopefully next year she will actually dance at the recital. I like your philosophy and all you work and strive for.